The secretive U.S. Air Force X-37B robotic space plane has been cleared to lift off Tuesday (Dec. 11). 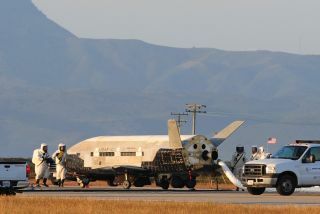 The X-37B vehicle and its cargo bay packed with a classified payload is set to make the third mission of the program. Also called Orbital Test Vehicle-3, or OTV-3, the unpiloted craft is slated to be hurled into Earth orbit by an Atlas 5 rocket from Florida's Cape Canaveral Air Force Station (CCAFS) at 1:03 p.m. EST (1803 GMT). There's an interesting angle to the upcoming mission. This third flight will use the same X-37B spacecraft that flew the first test flight, the OTV-1 mission, back in 2010. A different X-37B vehicle made a similar Vandenberg touchdown this past June 16, after staying in orbit 469 days on its OTV-2 mission. The OTV-3 flight had been delayed for several months due to an accident investigation board looking into why a Delta 4 rocket's RL-10B-2 upper stage engine did not perform as expected on Oct. 4 during a launch that successfully orbited a Global Positioning System 2F-3 satellite. The Atlas 5 that will hurl the OTV-3 into Earth orbit utilizes a different model of the Pratt & Whitney Rocketdyne RL-10 engine. However, per standard processes, the Air Force reviews all flight data to determine readiness to press forward with the next liftoff. According to launch service provider United Launch Alliance (ULA), which makes the Atlas 5 and Delta 4, a thorough flight clearance process was executed and all "credible crossover implications" from the Delta anomaly to the OTV-3 Atlas vehicle and engine system have been thoroughly addressed and mitigated. That work culminated in the flight clearance decision for the OTV-3 launch. The investigation into the Delta rocket flight data anomaly continues. The accident investigation board concluded that a fuel leak occurred in a specific area of the interior of the thrust chamber, and that this leak started during the first engine start sequence during the October launch. The anomaly investigation involves senior industry technical advisors, along with Air Force and NASA customers, explained Jim Sponnick, ULA vice president of mission operations, on the ULA website. "We thank the OTV customer for their patience and participation throughout the flight clearance process for this important mission," Sponnick said. ULA is a 50-50 joint venture owned by Lockheed Martin and The Boeing Company. The X-37B program is being run by the U.S. Air Force Rapid Capabilities Office. The two space planes in the fleet — which are 29 feet (8.8 meters) long and 15 feet (4.5 m) wide, with a payload bay about the size of a pickup truck bed — were built by Boeing Government Space Systems. The Air Force's Rapid Capabilities Office has a mission of expediting the development and fielding of select Department of Defense combat support and weapon systems by leveraging defense-wide technology development efforts and existing operational capabilities. According to an Air Force factsheet, the Rapid Capabilities Office is working on the X-37B Orbital Test Vehicle "to demonstrate a reliable, reusable, unmanned space test platform for the United States Air Force." While both previous X-37B missions touched down at Vandenberg, the Air Force has been reviewing the prospect of landing future flights at NASA's Kennedy Space Center in Florida, next door to the Cape Canaveral launch site. Returning the robotic space plane to the KSC landing strip — which was used by NASA's now-retired space shuttle fleet — would lower costs, because the vehicle wouldn't have to be transported back from California to Florida after each mission.